Swansea City have parted company with manager Kenny Jackett by "mutual agreement" after 34 months in charge. Chairman Huw Jenkins said Jackett felt he could not take any more criticism from the fans and the media. "I was very surprised when I received a call from Kenny on Wednesday and I'm very disappointed with how things have worked out," said chairman Huw Jenkins. "He was upset. He's thought things over and felt the criticism against him was difficult to take." Jenkins added: "He didn't know where to go from here - whichever way he moved forward, he felt it was only a matter of time before the criticism from the supporters or the press would get on to him again. "He felt for the sake of the club and himself that a parting of the ways was the best thing to do at this time." The 45-year-old took over the Welsh club from Brian Flynn in April 2004. On the pitch Swansea have struggled to meet the high expectations surrounding the club this season. The Board has backed Jackett with significant transfer funds, but major signings such as Rory Fallon and Leon Knight never fully delivered. Last week's 1-0 home defeat against Oldham bundled the Swans out of the play-off zone and left them 11 points adrift of the automatic promotion places. Jackett becomes the 29th manager to leave his post in the Football League and Premiership so far this season. Assistant Kevin Nugent will take charge of first-team affairs for the game at Doncaster on Saturday and will be assisted by the existing coaching staff at the club. Former Coventry boss Micky Adams, former Everton boss Joe Royle, ex-Wales striker Dean Saunders, ex-Wales defender Mark Bowen and former player Roberto Martinez have been mooted in some quarters as possible replacements. Martinez captained Swansea but fell out of favour with the manager before leaving the club, something some fans have never forgiven Jackett for. On Monday, Jenkins held a long meeting with Jackett to discuss the current situation and how they could improve results. Jackett's future as manager was never questioned, according to Jenkins. "It was a positive meeting," he said. "It was all about looking forward to the next 15 games, and even looking at bringing a few loan players in." But Jackett has decided that it is the right time for him to walk away from south Wales. "In the three years that Kenny has been manager, we have won three cups, gained promotion from League Two and come within a penalty shoot out of reaching the Championship," read a Swansea statement on Thursday. "The club feels that some of the criticism directed at Kenny from all quarters has been excessive. "The Board has worked extremely closely with Kenny over the past three years and found him to be a passionate and committed person. "Due to the nature of this relationship it has been extremely difficult to accept that Kenny's time at the club is at an end. "Sometimes you only find out the true value of something when you no longer have it and only time will tell if that proves to be the case in this instance." Jackett, who also has managerial experience with Watford, had been assistant boss at Queens Park Rangers for three years when he beat off competition to land the Swansea job. 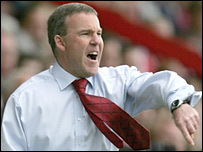 In the following 2004/5 season, his first full one in charge, Jackett led Swansea to promotion to League One. Swansea signed off from League Two with a move that summer from the Vetch Field to their new 20,000-seater Liberty Stadium home. A second consecutive promotion almost followed, only for Swansea to lose out in the play-off final to Barnsley on penalties. But despite the disappointment of not reaching the Championship, Jackett did lead Swansea to a second successive FAW Premier Cup win and picked up the Football League Trophy. Jacket was rewarded with a contract extension at the start of this term that ran until the end of the 2008-09 season, but that has now turned sour. In total, Jackett's record in all competitions with Swansea reads: played 163; won 75; lost 48; drawn 40.